Nina and her independently minded friend Monkey thrill audiences on both sides of the Atlantic in the sitcom Family Tree and on tour. As the cheeky monkey puts it they are ‘genre-defying,’ but what does he know? He’s not even real! They’re joined onstage by Lydia and a mask-wearing volunteer from the audience. 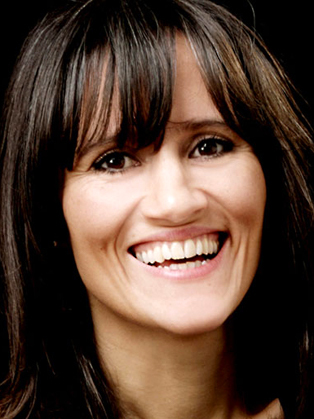 Nina Conti ran away from the Royal Shakespeare Company to become a ventriloquist. She has since wowed audiences from Las Vegas to Melbourne to the Edinburgh Festival. Her regular sidekick Monk claims Nina’s act is ‘genre-defying’, but then he’s furry, full of foam and lives in a small box, so what does he know? Nina takes ventriloquism away from traditional family entertainment towards something more edgy but convincing and irrefutably hilarious. Her own clean-cut image and Monk’s cutesy appearance cannot disguise a less than innocent vocabulary and outlook on life, audiences and working with Nina. As well as the monkey, Nina is often joined by poetry-writing Owl, her Scottish grandmother Granny, loud-mouthed New Yorker Lydia, and frequently by a member of the audience who, via a mask that covers the lower half of their face, says the most outrageous and out-of-character things. An award-winning stand up, Nina’s performances have been seen on Live at the Apollo, Russell Howard's Good News, the Rob Brydon Show and Channel 4's Comedy Gala. As well as her stand up, Nina is a Bafta-nominated director for her film Her Master's Voice. As an actress she has appeared in the HBO sit-com Family Tree, as a weather presenter (with monkey) in the Hollywood film For Your Consideration, and as Dylan Moran’s ex-girlfriend (without monkey) in Black Books. Other TV credits include QI, Ant & Dec’s Saturday Take Away, Sunday Night at the Palladium, Loose Women and the comedy series Single.